See the product in action. 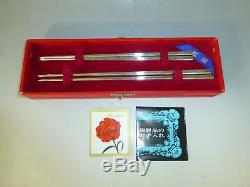 Vintage Top Grade Sterling Silver Chopsticks. Two Set Of A Pair In Original Case (See Listing Pictures). A PAIR OF FINEST QUALITY MASTERLY HAND CRAFTED. 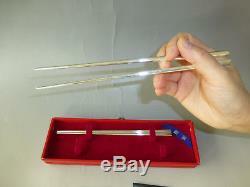 VINTAGE JAPANESE STERLING SILVER CHOPSTICKS. THE PAIR ARE STAMPED WITH MAKER'S SIGNATURE AND JAPANESE STERLING SILVER MARK GIN-SEAND COME WITH ORIGINAL VELVET LINED PRESENTATION BOX. SIZE : THE CHOPSTICKS MEASURE APPROXIMATELY. 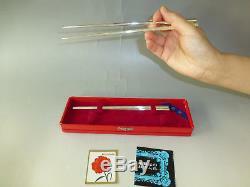 SMALL CHOPSTICKS : 7 5/8 INCHES OR 19.2 cm LONG. 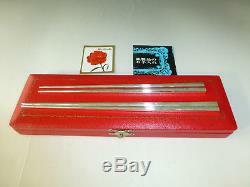 LARGE CHOPSTICKS : 8 3/8 INCHES OR 21.2 cm LONG. 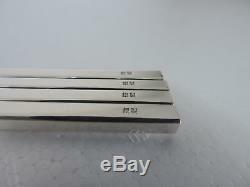 WEIGHT : THE COMBINE SILVER WEIGHT OF THE CHOPSTICKS IS 49 GRAMS OR 1.7 OZ. 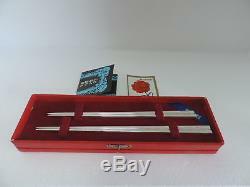 MORE INFORMATION OF USING STERLING CHOPSTICKS. 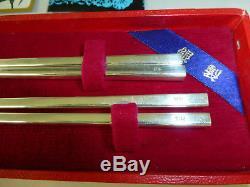 Silver chopsticks hold a special place in the history of chopsticks and China. China is not naturally rich in silver and was a rare commodity. Silver was in such demand that it held mystical qualities. It was believed that silver would turn black if they came in contact with poison and therefore were used by emperors as a protection against poisoning. The desire for silver chopsticks and the poison-detecting belief spread to Korean aristocrats. Today we know silver has no reaction to poison. 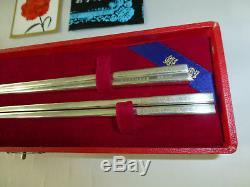 Silver chopsticks are still popular among wealthy families in China and Korea. 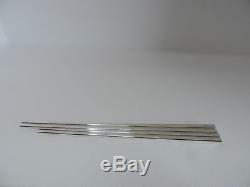 Cheap silver plated chopsticks can be found for less but their quality is generally very poor and will not last. 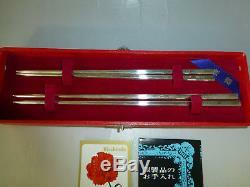 One of the earliest silver chopsticks on display can be found at the Luoyang Museum in Luoyang, China. 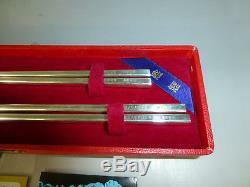 The silver chopsticks are from the early Song Dynasty and are part of a set along with a cup and spoon. Luoyang was the capitol of the Han dynasty in the early 1st century and the museum offers exhibits of the rich cultural heritage of early China. We are eager to work with our customers. 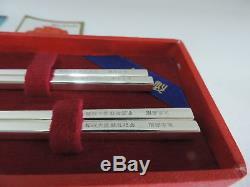 The item "Vintage Top Grade Japanese Sterling Silver Chopsticks Pair In Case (Watch Video)" is in sale since Friday, March 2, 2018. This item is in the category "Antiques\Silver\Sterling Silver (.925)\Other Antique Sterling Silver".